Forget about the Apple versus Android war for a second and just look at the iPhone has an innovative piece of technology. At the core, we can all agree that its capabilities to make calls, play music, connect to the Internet, enable thousands of apps for different purposes, and take 3D photographs are pretty great. What’s that? You didn’t know iPhones could take 3D photographs? Clearly, you haven’t discovered Poppy. Poppy is a device that can turn your iPhone – as long as it’s an iPhone 4, 4S, or iPhone 5 (fifth generation iPod Touches will also work) – into a 3D camera capable of capturing both still photographs and full-motion video. How it works is simple: Inserting your iPhone into the device allows the phone’s camera to capture two stereographic images via mirrors contained within the Poppy. This essentially splits the camera’s eyes so that it records two different images at once. When you look through the viewfinder of the Poppy device, the lenses combine both of those images into one 3D image, whether it’s video or a still photograph. 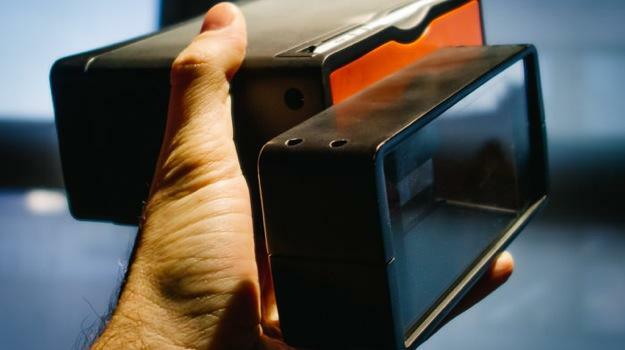 Essentially, it’s a modernized version of the classic Viewmaster stereoscope viewer, except that this time, you can take the images yourself. Which is, let’s be honest, more than a little neat. The Poppy isn’t available just yet as it’s the subject of a Kickstarter campaign by creators Ethan Lowry and Joe Heitzeberg in Seattle, WA. In just nine hours after the project launched, Poppy raised all $40,000 of its original goal and have exceeded twice the amount requested in two days. On the campaign page for Poppy, Lowry and Heitzeberg cite the Viewmaster as an inspiration, as well as the 1800s stereoscopic devices that in turn inspired the creation of that childhood favorite. Poppy may be a hit with the crowds in its early stages, but its creators aren’t laying on their laurels; they’re already considering future possibilities and additions to the device. Some ideas include allowing other developers to create augmented reality apps that could use true 3D visuals for the first time, or other outside apps taking advantage of Poppy’s 3D capabilities. If all of this sounds like something you’d want to try out for yourself, all it’ll cost you is $39. That’s the level of pledge that will guarantee a Poppy from the first production run (due before the end of the year). All things considered, it sounds like a pretty great deal.